This week a fellow Pacific alumnus* posted an article about balancing writing with other work. The article points to a lot of what I did in grad school in order to eke out the time for the required reading, annotations, commentaries and writing: reading on the train during my commutes, writing at my desk during lunch, checking in weekly with writers in my cohort, taking walks to clear my head of non-writing malarkey so that I could focus on what was important. Megan Burbank, the author of the article, also says, “Remember what your writing practice actually encompasses. It’s probably more than just writing. Those hours count too.” It reminded me of some early advice I got from my first advisor, Bonnie Jo Campbell, who once told me that she was making pear wine while she was thinking about one of my stories. Really, it was less advice than simply good example. I have trouble sitting still, doing just one thing at a time, and Bonnie’s pear wine taught me that I needed to find the thing that let me do some deep imagining – really thinking about my work, exploring its possibilities, listening to what the story had to tell me. The pear wine directed me to the kitchen, where it was possible to think about my characters and to whip up something tasty simultaneously. Lately, that something tasty has been pie. Yesterday, I spent a few hours in the kitchen making pies for a friend’s birthday. 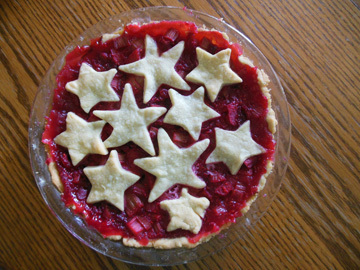 I conjured up an apple raspberry rhubarb pie, an excuse to use Fanny Farmer’s recipe for basic piecrust, which turns out perfectly every time I make it—even if it is a little different each time. 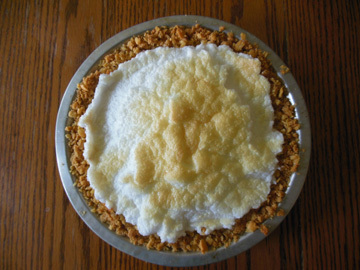 I tried out Atlantic beach pie, with tart lemon custard and a salty crumbled crust, and I flubbed whipping the cream so I improvised a meringue. I turned fresh farmers market blueberries into a fresh blueberry pie using a recipe from somebody else’s mother. The hours I spent in the kitchen yesterday were part of unwinding from the structure of my MFA, part of rebuilding my writing practice to find what helps me do the work of writing when I can’t sit still. Lately, I have more confidence with Fanny Farmer’s piecrust than I do with my own paragraphs. And taking the whipped-cream-turned-to-butter in stride was a good lesson in rolling with what the work gives me; making meringue instead was a good lesson in keeping at it, working through the difficult patches. 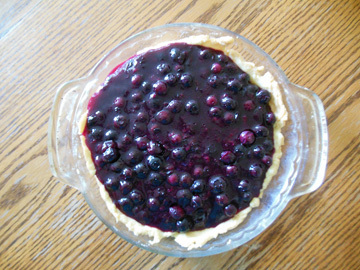 ** The blueberry pie was easy and fun, like working on a blog post about pie instead of a novel about grief. Of course, making pies does not take the place of actually sitting in my desk chair and doing the hard work of writing. But baking pies, and sharing them with friends, is part of what helps me think about how the world fits together and how writing fits into my world. * The person who posted the article was a guy. I’m just assuming “alumnus” is correct here, since our language is male-centric. I know I’m an “alumna” of Pacific; this could lead to another post entirely. ** I used to insist on making meringue with a rotary eggbeater, which used to be a staple of American cookery. Then my mom insisted on giving me a Kitchen Aid mixer as a graduation present. My desire to multitask, to make meringue AND to wash dishes, trumps my historical loyalties. Call me fickle. What tasty fun, Hilary! Pies can improve life almost as much as stories. Do you know this poem by Grace Paley? Thanks for sharing this poem, Bonnie! Perfect!